reflecting pools, bay windows, modernist, victorian, san bavón, san francisco, i know what a cage looks like. a pretty thing stuck in a pretty place that changes, forgetting you are there, closing in on you. i know metaphors, and in central america, eventually a beautiful, tropical bird, a scarlet macaw for sure, should show up in señor ortega’s condo, to tell me how pretty i am. but instead, i unbox a white toy swan, floating, staring vacantly into shrubbery. he likes it when i leave all the lights on and faucets running. i imagine running my index and middle finger from the bottom of the switch and. slowly pressing. it on, hearing a sigh from a man i’ve never met. i couldn’t do this at first, california’s in a drought, my hands clench whenever the utilities bill comes in, my rent just went up. it took us so long to get close, because i let him find himself in the dark and without the soundtrack of fountains. when i gave in, lighting up all his artwork, the desk lamp, the stairs, it was like he could see love for the first time. a familiarity: i remember a time when i expected men to turn on their own lights, to take initiative to see, and, well, i was waiting a long time. it isn’t until i take their face between my palms and turn their gaze down do, well, they finally understand i am real. toiling, with paint and plants, creating a home for someone who doesn’t live there. it is, rather, cycling through grief, applying my lipstick to the mouth of a skeleton. he tells me, in notes, not to my face, of course, how he enjoys the home-making, the domesticity, that he never witnesses, never looks in the face. i wonder if he feels a rush as i run my hands up new wallpaper. i arrange his news clippings and photos as he stays with another woman. like clockwork, like a clockwork dollhouse I glide from the foyer to the kitchen to the bedroom, where, in notes, you wish to find me lying there, not following our business deal, and back off to reality, so you can live in dreams. i have a mirror right next to my bookcase, where i sometimes spot how my face looks watching something on my computer screen or notice the litheness of my legs and the angles they form. without much thought i adjust, like in front of a photographer’s lens, ready for my shoot, or in front of his eyes, to keep his attention from wandering. señor ortega must wish me to be some futurist mannequin, ascending the stairs, only to find large panes of glass blocking my way. i stare into my reflection, trying to see the other side, to get something done, to finally stay over, only to eventually fix my hair. when i left the place in the dark, after my chores, i would sit, reflect, and contextualize my service to gabriel. i shop at the magazine store now, picking out fashion advertisements, cutting out the figures, pasting them in cut-out rooms where they don’t belong. i don’t belong. but now that i turn on every light and faucet, foyer, office, wintergarden, dining room, living room, game room, bar, upstairs, after all of the art, i don’t have time to think. i start to write and the sun has set, and it is time to put me away. gabriel leaves open his book on magdalene, and all i can think about are the orchids my father grew when he became distant. one day he openly mocks my brother, defacing his portrait on a magazine cover, and the next, an homage, an altar in his bedroom closet. no matter what, the rich and the white don’t want to believe, that violence is never needed to move things along. mostly because they don’t often witness violence, the kinds in our homes, on the street, in our progress reports, over vietnamese dinner on valencia street. my pain is fictional until you can become the hero to stop it. you could solve all my problems, if you were to talk with me, face to face. why must it take a war for you to spend the night with me? i shouldn’t have hidden your queen playing telephone chess. you did me one worse, crates filling up the house, forgetting that a human walks and breathes here. i press myself against the wall, sliding, reaching, grazing my fingers up your light switches. it was like the walls were closing in, blocking the windows, any view of the outside world, boxing me in. for you to save the world, i have to make some sacrifices, i guess. i never picked up the change you left on the counter for me, like a test, or a bribe, or a shame. though the sun sets at the same hour, every day gets darker. it doesn’t really matter if i come anymore, i am already your muse, and soon your tragedy. you wrote “protect precious items,” and it was never crossed off the to-do list, so i accept that, because i survived, i am alive, i am not what you are talking about, that i’m not precious enough of an item, even, worth remembering to keep. Earlier this month was IndieCade, a festival that celebrates indie video games down in Culver City near LA. It’s actually a little more than that, also including non-digital games and tends to be more open to experimental and fringe work. It is open to the public and one of the more inclusive games events, and probably one I’d still appear at to see how things are moving along in the not-too-mainstream, not-too-artsy realm of games. I’m also a judge for the festival, meaning I help funnel games towards the jury to select for the awards and general inclusion into the festival. I want to take you through some highlights and games I saw there, and even some that didn’t make it into the festival but I judged and think are worth noting. I’m really into going to talks at conferences and conventions because I feel like it’s a good litmus test for where most influential thought is at; not necessarily the most radical, but usually ahead of the curve and educational for conference-goers who can’t be plugged into Twitter and academia 24/7. This IndieCade was centered around community, which is fitting since that word has been on everyone’s lips for the past year. Thankfully that meant a lot of talks about diversity, inclusion, history, and outside influences. Look out for recordings of these when/if they go up! The first talk I went to was “Let’s Not Make a Scene,” which mostly raised a lot of questions about groupings of people and how that works in industrial, artistic, and advocacy communities. The panelists were smart enough to not really get prescriptive of what is and isn’t a scene, and showed quite human complexities around scene making and power dynamics. Particularly salient was the story of how TIGSource forum devs set an unintentional standard and in-/out-group dynamic when many of those developers rose to prominence and were basically dubbed ‘the indie scene.’ A group of friends and peers became an aesthetic movement, and then became an industry in of their own. The problem with this is that power structures when it comes to visibility and resources were set mostly by the values of this group, however unintentionally, and access to all that surrounds the indie industry is affected by how many degrees, and what kind, of association you are away from this original group of people. This is also a conversation going on with the ‘Queer Games Scene,’ which I am included in per my wishes or not, and there’s a question as to how a similar dynamic will be created in this movement. Though I don’t think these two situations are comparable, I was glad it was still evoked and interrogated so we can at least be wary of replicated power structures of any group of people. Another panel that went over rather well was “Let’s Do Something About it” (only now seeing the repetition) with regards to race and class issues in games. In a weird way, I left it mostly glad I was not on the panel; not because it was bad, because, like, finally other people are being recognized and I don’t have to be one of the very few people talking about race in games. They had a wonderful line up with devs and writers in different aspects of their careers and analysis, but were pretty resonant about their experiences of being in games spaces and having the topic of race shut down on them. It was good to hear, thankfully no one really does that to me so I don’t speak about that aspect often, but the panel showed how various aspects of racism and classism sneak up in the independent scene. The most salient point I took away from it was how non-white people just don’t even see the opportunity to get involved; either the resources they need are never offered to them or spaces are so white and east asian and don’t make the effort to extend out an invitation. This is in contrast to how there are so many initiatives to get women into these spaces, that sexism is the current ticket-item everyone is focusing on, instead of taking a multi-prong approach to diversity and inclusion issues. The last day of the conference I spent mostly in City Hall, which was appropriate because it was all the more serious, political talks of the conference. The first session was an overall town hall kind of meeting, where people aired out concerns and action plans for change in the industry. What I deduced from the session is how people really wanted to be heard, on an individual level, about their feelings and thoughts about what’s all going on in games, and don’t often get the chance. There was a lot of grand statements and aimless frustrations, but it was probably helpful and shows we need public venues to vent grievances that might lead to some actual plan of action. My contribution to that discussion was the need to actually listen to people who know what they are doing, like activists and other people who engage with social change more frequently than the average indie dev, to have the resources and platform to enact change. I was then part of a microtalk session called “Why ___ Matters,” where each panelist filled in their own part about what matters to games. There were definitely recurring themes, such as looking outside of games and the gaming community for reference and life, and also the negligence to self-care and valuing people’s livelihood. My talk in particular was ‘Why Reality Matters,’ where I hopefully challenged the body-detached attitudes of games as a whole, both in craft and the treatment of artists and activists. If you are a frequent reader of my work and tweets, you probably wouldn’t be surprised at the things I talked about, but all in all, I wanted to have reality be a design inspiration, and for play to be more applicable to reality and its issues. And, of course, it is a games festival, so there are lots of games I witnessed and played. One was Squinky’s Coffee: A Misunderstanding, which is a super interesting theatrical, narrative generating awkward situation simulator. There are multiple performers in this game: two are the main characters, who read and interpret lines given to them from the drivers, two other players selecting options, and there’s also a musical accompaniment that also gets instructions. What is most interesting to me about Squinky’s game is it’s a sort of social catharsis game for awkwardness, when two people have separate goals and comforts that collide with one another. It also shows how people’s actions can be interpreted multiple ways depending on their context. We get a lot of this from some more narrative based roleplaying games, yet there’s an added usually unreachable element when you have it set up like a performance. The mundanity of it all made it pretty relatable. Elegy for a Dead World by Dejobaan Games and Popcannibal was actually a game I looked at last year for the IGF and was quickly on board with the concepts it was playing with. The game puts the player in these beautiful panoramas of abandoned worlds and at certain scenes prompts them to leave some words. It’s pretty open-ended, though it has options to give the player a sort of ad-lib structure to work with. I think it aims to be interpretive and meditative; there are few games that ask you to reflect and be creative. It’s very moody and a great start to an interesting idea. I’d like to see more invitations for interpretation, and I’d also like to see how the metanarrative of it all comes together once it’s released. I was also pretty wowed by Ice-Bound from Down to the Wire, another narrative game. I am a more narratively-interested person, but I don’t think other aspects of games stood out for me this year at the festival. And Ice-Bound is a good example of a future of indie games that I’d like to see, where access to technology reframes our relationship to storytelling. The game is part physical book, part digital-technology AR sorta interpreter, where you see different kinds of information on both and are trying to uncover what happened. This really got me inspired to remember and rethink games in the past that were part physical artifact, and part digital. In particular, manuals and strategy guides, how can we incorporate those into contemporary play? Beyonce: Two Souls: I mean, the title should say it all? It was one of the few games I actually laughed with, using humor in a particularly video gamey way. Not like in a meme-knowledge manner but in a sort of surrealist deliverythat really uses the medium and conventions. I hope it becomes more developed than when I saw it, which was months ago so I imagine that’s the case, I’d definitely check it out for laughs with Queen Bey. FutureCoast: An ARG that taps into the climate change discussion through player-generated apocryphal fiction. The most interesting aspect of it were the recorded voicemails left by people around the world depicting some sort of natural disaster that evokes climate change anxieties. On top of that, people could create what is basically a playlist of these voicemails, connected by whatever topic or theme they noticed. I thought it created a really interesting look at the collective unconscious about how people feel out of control about the environment, and it’s being exhaled through all these apocalypse stories. The Sun Also Rises: I just found out this is also the name of a Hemmingway piece, and I don’t like Hemmingway, but alas, this is a pretty looking game that is very ‘post-Kentucky Route Zero’ game, if the gentlemen at Cardboard Computer don’t hate me for saying that. It’s set in US-occupied Afghanistan, and the main conversation is between a boy growing up in that culture and an American soldier. When I saw it, I think they were prototyping some narrative experiments that didn’t really jive well with me, but I think through development it’s going to turn out really interesting and be quite the pertinent theme. Just realizing now that it has two different kinds of non-white people as main characters without being awful stereotypes, so that’s cool! Of course there was a lot more going on, but hopefully you all click through all that and see there’s interesting stuff going on, and a lot of it you can support! At least three of these games have/had fundraisers, which shows public patronage of weirder stuff could stay an important part of developing fringe work. Next weekend is the Queerness and Games Conference, which will round off my busy October, so stay tuned for my notes from that! It’s going to be great, and I believe it will be streamed, so keep an eye out! What the dominant paradigm of design does is create a system for the player to uncover, and game within that system. It is ultimately a puzzle, though the creative process of moving within situations isn’t something to be disregarded. Rather, it’s not the complete picture, particularly for play experiences that don’t want to do something explicitly goal-orientated. I’m pretty much over ‘elegant’ systems because they typically don’t say too much interesting. Instead, I am curious about inviting players to interpret their experience and contextualize it in their own lives. What separates tarot cards from playing cards, or most cards really, is the recognition of infinite interpretations. And not like inconsequential variations, but a discernable capacity to hold many different meanings and provide different contexts. Taking the difference between the five of hearts and five of cups, a visualized version of the five of heart’s ancestor, demonstrates the difference of meaningful interpretation. The five of hearts has very few meanings as it is used in playing card games; it is higher than numbered four cards, lower than the six ones, and is of the heart suit. It’s boiled down to a function, and carries with it the idea of optimization. That is, conventional game design leans on discovering optimal play, and the meaning of its parts don’t exceed much from that. 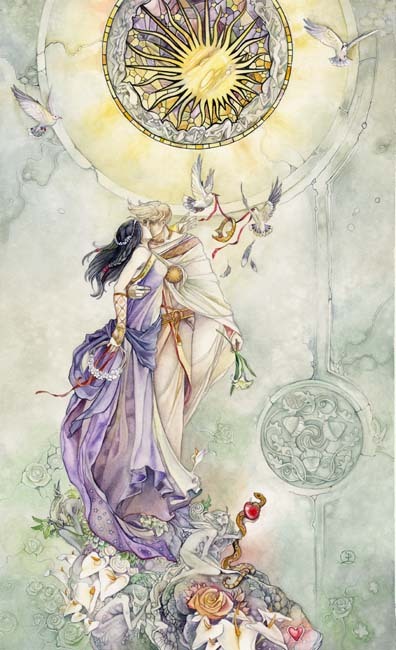 When the five of cups is placed down, what ultimately determines its effect are the people involved interpreting it. There are many canonized ways to read cards, however personal style is trumped over any other sort of prescription. There is also the idea of the five of hearts and cups, that is, how they as an archetype do or don’t change over time. You can change the imagery of the five of hearts as much as you want, but it will always be cosmetic. Same with Netrunner cards; the meaning is based in the quantitative system that relies on a strict and clearly communicated ruleset. While changing the image would change it’s flavor, the meaning of the card stays the same. I don’t want to disregard the appropriation of games, much like I did with Netrunner, and that bringing in cultural context and modding does emphasize these other parts of the game object. I’m particularly concerned with play experiences being interpretable and subversive on their own and with intention. With the tarot, different images drastically change how the card is read and interacted with. Every layer of the card itself is meant to be accessed and used by the play that is interpretation. And, of course, tarot cards aren’t the only kind of imagery out there, there are many sets of cards used in similar ways that are made completely in their own context yet still work as an exploration tool. Yet the kind of interaction implied by tarot cards doesn’t completely disintegrate because of this mutability, rather it’s boiled down to the act of interpretation instead of a jungle gym of rules. There is no wrong way to read the cards; that’s not a placation, but an important aspect of play. 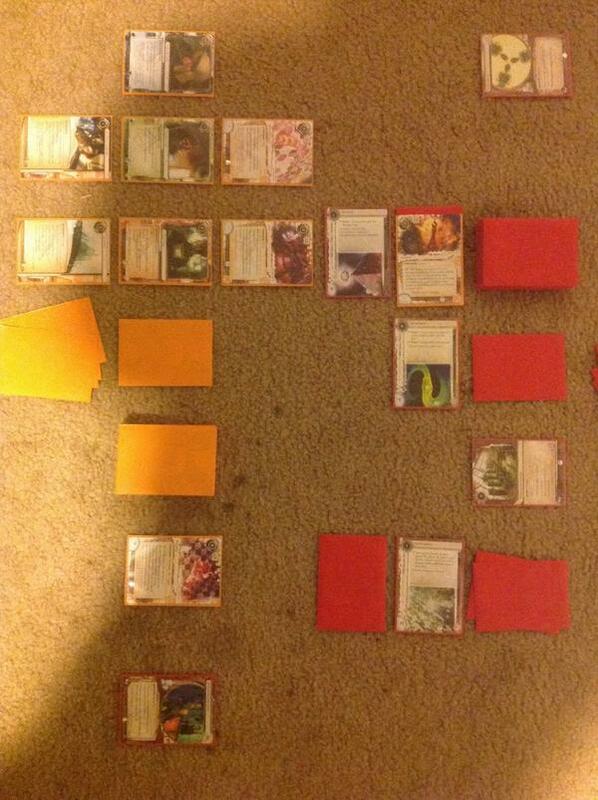 Really, each card is a tiny bit of experience design. Visuals can be evocative on their own, yet it their relationship to other cards, both in the same deck and in other ones, that make designing in tarot so easy. 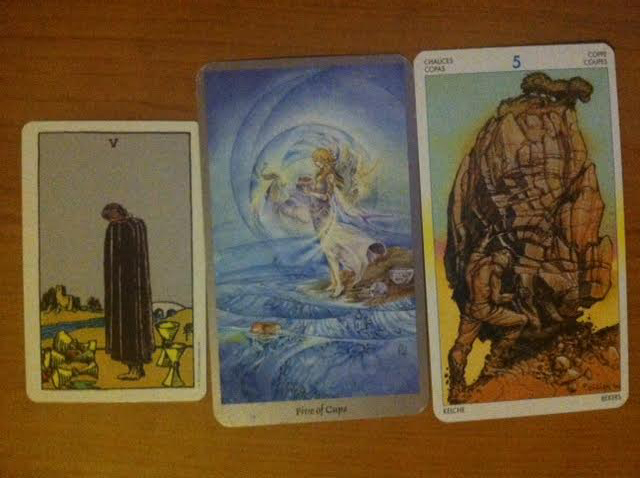 As well, the act of doing a reading with these cards is design and creative in its own right. Take just how to get the cards on the table. Are the cards shuffled? Who shuffles them? Where do you draw from in the deck, and who draws them? This sets up the tone for the entire reading and provides context for how the players can interpret what comes next. If the reader shuffles the deck and deals out from the top, it is reminiscent of gambling, so the feeling of fate or luck is stronger. Or maybe the dealer fans out the cards on the table and lets the querent pick. There’s something magician-like, it’s showy, and lets both feel like there’s some personal responsibility in what cards show up. Maybe the reader asks the other player to sift through the deck and chooses a card that resonates with them. This is more interactive and focused on the subject and their informed instincts. The cards are flexible enough to bring their own meaning to these sorts of contexts, and withstand the invention of new methodology. What happens when a card falls out while shuffling? 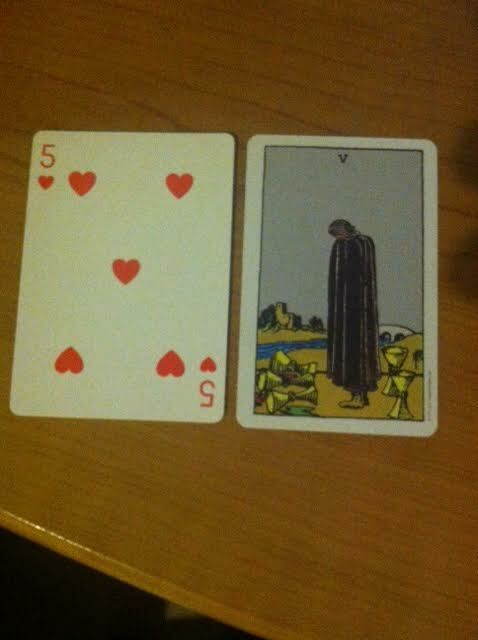 Does the card at the bottom of the deck at the end of the reading mean something? 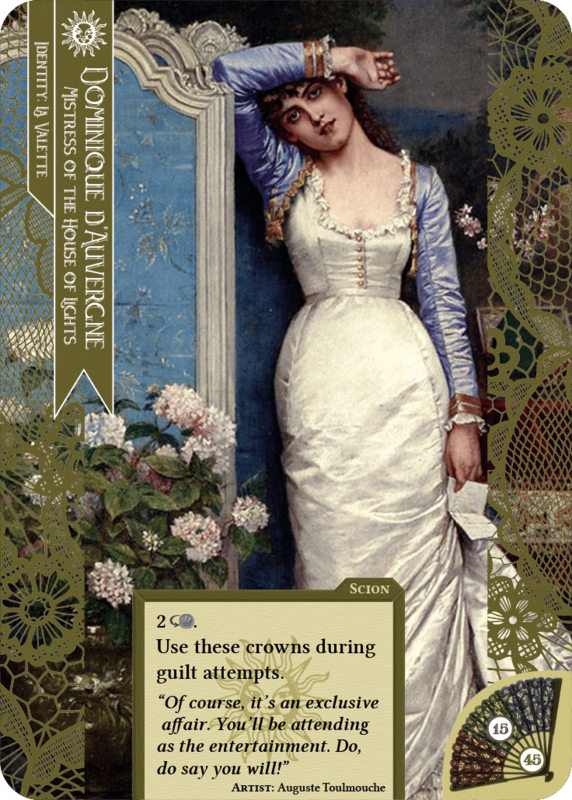 Because these cards lend so well to the creation and manipulation of contexts, they have more mileage in playful activities outside of puzzles, which they can still be used for. I also don’t want to get so hung up on these being cards. You can sub out cards for any object, objects being, taking a cue from anna anthropy’s work, what players interact with to further involve them in play. We are too used to instrumentality of play, or the gaming of it. Conventional design wants you to make sure objects have functions that move the player further along towards their goal, even if that goal is letting the player exercise agency over what their goal is. In contrast, interpretative objects are looking to evoke a response that will be mediated by a person’s unique perspective. This is what I’m trying to get at really, that we there isn’t enough play with symbolism, both on the creator’s and player’s sides. Why bring up all this? The tarot might seem like a stretch, but consider how conventional games try to communicate stories and meaning. To be blunt, it’s usually hamfisted because the game is often trying to act as entertainment based more on reflexes or quantitative systems. This doesn’t mean that these kinds of games don’t bring joy or particular kinds of meaning, rather that play as a medium is severely limited to similar games unless it allows for more interpretation. Some of these games are already out there, but it’s not a surprise they aren’t featured much in mainstream coverage. If anything, I just want to raise the question as to why there isn’t a lot of interpretation going on in games. My hunch is because of the canonized idea of games mostly being composed of rules that need to be fairly communicated to the player, vagueness is discouraged. I think game design is so wrapped up in getting players to ‘do something,’ to verb, that self-reflection isn’t really something that gets picked up very often. Or for someone to go through an experience without having or needing a goal. 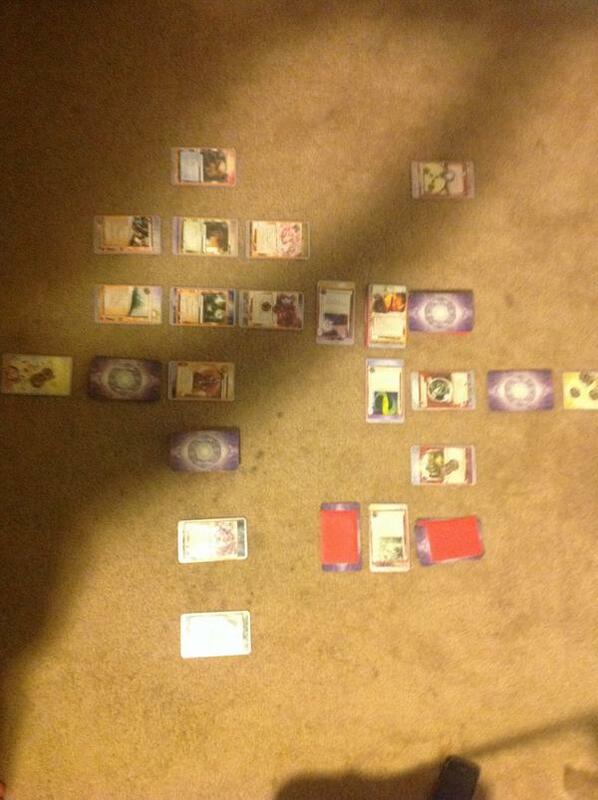 What would games look like if we adopted the use of tarot as we have them now instead of playing cards? I want to see that. Notes: This post discusses depression, and those with related triggers should proceed with caution; a section of this video records a game on New Grounds which features generally discriminatory advertising. Welcome to the first of many B-Side videos, a series that will look at free indie games and how they continue to evolve our artform. This episode, I’ll be discussing Depression Quest by Zoe Quinn, Patrick Lindsey, and Issac Schankler. Depression Quest is an interactive fiction, possibly non-fiction, game that takes the player through an experience of dealing with clinical depression. But even as I say it, that doesn’t really do the game justice; to say Depression Quest is simply about depression misses the interesting design philosophies at work here. Someone smart at some point in my life either quoted someone else or said something akin to “Through the very specific, art becomes universal.” It speaks to the uptick of the hyperpersonal going on in games right now, and how it resonates with so many. Depression Quest is interesting because it blurs the line between fact and fiction; it is a rather distinct scenario with certain factors already present going in, but it isn’t hard to fit yourself into the role of the main character. It’s like games’ answer to creative non-fiction, and this choice made by the developers is important to point out. Depression Quest is for a couple different audiences, and a player could fit into more than one. Mainly, there are two ways a person can approach it; looking for solidarity in a shared experience and gaining empathy through a shift in perspective. It is possible to do it both ways because this game both is and isn’t about depression, is and isn’t about a particular person. The most powerful mechanic is actually the lack of choices open to the player. At least, all of the seemingly obvious ones most people assume are available are blocked off from those depressed. This instantly complicates common advice that ultimately sum up to “just make yourself feel better.” You see the options right there in front of you, but the system keeps them out of reach. As far as I know, I don’t have depression. My best friend of many years, and others in my life, do, and very often I couldn’t understand the chronic flakiness and inability to express what they were feeling. Depression Quest did a couple things to bridge that gulf and create a channel for empathy; the formerly discussed blocked choices, and the archetypes found in the various people in the main character’s life. I personally found myself almost verbatim in Alex, the player’s girlfriend. Through a specific lens, the positive energy that a person can provide someone who is depressed can actually be immensely negative, and it was interesting essentially playing against myself. The character didn’t have the options available that would please me and Alex. Upon multiple play-throughs, I became more aware of the way choices start to open up and close off, and how this is only partly intuitive to the player. On my first run through the game, I tried to be as honest and positive as the options would let me. The unavailable choices already created a ceiling I wouldn’t have assumed, and at times, made me choose something self-destructive. The unrelenting openness left my character vulnerable and caused them considerable pain at times. It made me reconsider my own tactics, about how that path is only serving the interests of others, and not my personal safety. In a future playthrough, I came to find a strategic mix of self-preservation and openness balanced your mood and other’s happiness, shown by the increased number of available options. Then I was curious about what it looked like to be the lowest of your low. I was expecting something melodramatic and constant encounters with suicide, but my assumptions were met with something else. Suicide was more of a long dull pain, and what really characterized deep depression was the lack of control. More and more options were taken away from me, and I was forced to make decisions I knew would end badly. Depression Quest uses its choice structure in a rather clever way to comment about therapy and taking medication. While everything leading up to therapy is dependent on your mood, the choice to start drugs and continue therapy are always available to you. It communicates having agency within that situation whereas in the rest of your life, you don’t. I liked that the developers were able to show contrast within their mechanics in a positive way, where usually designers like to give players a whole bunch and then take it all away. Games like Depression Quest also help reaffirm a sort of community status for those who are illustrated in them. Depression Quest sits in an ambiguous area when it comes to how much of it is imbued with the personal experiences of the creators. Mainstream games typically make characters broad enough in attempt to have players easily identify with them. The logic is the player will fill in the holes and complete the character. Hyperpersonal works reject this notion by forcing the player to keep themselves out of the characters. Games like Dys4ia, by Anna Anthropy, assume many people playing it will not have shared the developer’s experience and instead has the player relate by reaching into their own personal history to establish empathy through the system. Depression Quest does a little of both; there are clearly autobiographical elements, used to create a very specific experience while, at the same time, it stepped back and allowed the player to fill themselves into this experience. I knew this was about depression, and felt those unique circumstances, but I could relate through my own experience of considering hormone replacement therapy. I didn’t need to have depression to find solidarity in this experience. I’m not sure if I have words for what exactly Depression Quest does, but it is one of the fuzziest blends between author and player I can think of. Actually, this idea is encapsulated by the great sound design of the game. The main theme plays as the constant reminder of the character’s illness, though it could be abstracted to just about anything. Then noise eventually breaks through and takes you out of your head. Sometimes it’s clear and sharp, and on worse days garbled and painful. The ambient sounds pull players from the general narrative where they easily project themselves and into specific scenes undoubtedly from an author’s past. In a sense, Depression Quest applies how it handles fiction and non-fiction to depression itself- it alters reality while not striding too far away, leaving people in a constant state of confusion. This is only one aspect of Depression Quest that’s interesting, and it’s obviously a hit. Not only is it a great game for playing, it’s great for sharing. Another topic altogether, but to me, it shows a bright future for games, how they can be used to help people communicate when their words aren’t enough. I think Depression Quest helped put more work like it on the map, and I can only see more games like it being made. So, that’s it for this episode! Go play Depression Quest at depressionquest.com and consider donating to the development team for their work. Also, e-mail me your thoughts, suggestions, and questions at matti.brice@gmail.com. Thanks for joining me on the first take of B-Side, I hope you’ll join me next time for another talk on free indie games. Rule 1: You can only catch the first Pokemon you encounter in each area. Rule 2: When a Pokemon loses all its health, it’s dead and must be released. Rule 3: All Pokemon must be nicknamed. There seems to be a couple of conversations that just won’t die. At any given moment in the discussion on how we are to consider games, someone is choosing their position on whether the rules of the game matter or the narrative in a game, while another decides if a particular video game is even a game or not. While there is value in any critical thinking, it’s curious writers still feel they have something to add to conversations that always dissolve into some sort of nihilism. We have smart pieces like Leigh Alexander’s “Tale Spin” that continue to tiptoe towards the edge away from these questions, taking sure but frustratingly small steps (“Opinion: Tale Spin”, Edge, 19 March 2012). In the essay, she moves past the allure of equating everything noble about games to their capability to tell stories, batting away shadows that still linger of the “but other mediums…” attitude. Her article ends with a shrug, considering an alternative way to look at games, but it also offers an insight that she might have not seen coming: storytelling in games has never followed the methodology of other mediums. The moments that Alexander mentions are especially poignant to players, and we’ll never get past this conversation if we continue to see storytelling in games as being like the traditional story elements that we recognize in other mediums and not as the moments of experience that games often engender. A recent victim of the “legitimacy police” is Dear Esther, unable to catch a break from one armchair opinion to the next. It’s also a game that fails to produce much when assessed by its story and not its narrative design. The narration is one of many elements that the game offers, but players rarely move past it to analyzing its storytelling methods. In actuality, Dear Esther is about encountering many poetic moments while simply walking through a space. Listening to a speaker is only part of some of those moments. It is the change in visual details on a second run through that causes the player to doubt themselves and others. These moments when the player questions their memory and realizes that this isn’t the same walk that they took before is how Dear Esther tells its story. For some reason, we’re quick to throw out the interactive element of in much of storytelling that existed long before video games. From bards weaving epic tales for an audience to a child in our own century interjecting their thoughts and questions into a tale told at bedtime, stories have been mutable and dependent on those involved in telling and listening to them. Video games reinvent this idea by using game mechanics as a method for the player to internalize the narrative, a method in which their personal disposition interacts with and changes the story. In essence, Dear Esther is provocative because the interaction takes place within the player and not superficially within the game. In a sense, Dear Esther puts most games that feature walking as an activity to shame. It critiques games that use innumerable amounts of game mechanics to communicate experience. It achieves much with just one. It is the next game in the line of great level design in which the Half Life series resides. Dear Esther implies that every game with walking in them can achieve the moments that it does, and that there is something to aspire to. This is because we commonly see the narrative experience as merely story, stock plot, characters, and setting used as a vague excuse to explain why the player is hitting monsters and mixing items. While Dear Esther has a narrator, he only creates a sense of linearity to subvert it on a second playthrough, which ties into how the game gives the player moments to experience. That’s the purpose of all of the game’s elements: the visual design, heavily limited actions, and changing details. There is no fat in Dear Esther because everything in it aims at doing one thing and that is allowing the player to internalize these moments. Alexander is right. Games like Mass Effect 3 and Tales of Graces f will not be the highest form of video games as stories. They rely too much on story to provide an experience and rarely allow the player to internalize moments. Video games are still in a position in which storytelling remains a spectacle and is regarded only in a superficial manner. If the medium’s storytelling is assessed through the narrative structure that allows players to feel these moments, then narrative in games isn’t something that you take or leave but is integral to a game’s experience. Dear Esther’s public recognition allows us to make a paradigm shift towards recognizing how video games do it differently and to build upon the first steps of exploring the medium’s capabilities even further. So let’s do it. Dragon Age II is subversive on multiple levels, focusing on character relationships with fluid sexualities instead of the usual epic storylines. What most people miss upon a superficial playthrough is BioWare’s statement on contemporary social issues. Everyone can recognize the set-up: the Templars as the safeguard of tradition and society, while the Mages represent the oppressed and the often abused. It’s not a huge leap to compare this conflict between social (typically religious) conservatives and minorities like the LGBT community. The game exaggerates the relationship, creating a situation that couldn’t happen in reality. Thus, the philosophical ideas that inform the conflict aren’t constrained by the factual details of our world. No one is implying that the LGBT community turn into blood magicians and that the religious march out to cage and murder them, but this conflict still echoes the tensions felt in the lives of real people. BioWare was successful in avoiding moralizing by not choosing a side, while providing enough interactions to allow the player to take a stance on their own. While it is easy to side with the Mages, especially when one thinks of them as social minorities, one cannot ignore how many of them do resort to blood magic and turn into demons. Anders blowing up the Chantry is at the center of this issue, tying sympathy and anger together in an uncomfortable knot. General reception of his actions has been negative, creating the possibility of a more “obvious” support for Mages to be made problematic. The player’s gut reaction is to reprimand Anders in some way, that pushing against violent oppressors is okay—until you get violent yourself. Comparing him to a contemporary social minority, however, lends a perspective that complicates our thinking of both Anders and social change. BioWare uses Anders to ask, “What led up to this? Why did he do it?” The player takes a position of privilege in comparison to the other Mages in the game, since they are open about their Mage identity and don’t face the danger of finding themselves stuck in the Circle. It’s simple for the player to assume a “be patient, one day it’ll all get better” attitude that inactive sympathizers really do adopt when speaking to groups like the LGBT community. Hawke is more of a witness to social change than a catalyst, and despite choosing to support the Templars or the Mages, it’s too little and too late for Anders. From his point of view, there is only blood on his hands. Does he murder by his own volition or with apathy? From Anders’s perspective, if every day without equal rights is a day too long, every Mage murdered before he executes his plans to free them is on him. The player encounters many situations in which Mages are forced to submit, turn to blood magic, or die. Additionally, there remains the personal anguish of constantly remaining in hiding and being told by a culture that something is wrong with him. It is no coincidence, then, that the “demons” that he deals with are named Justice and Vengeance, literally an embodiment of rational anger towards society. Dragon Age II offers no solution to the problem that the Mages face except for what Anders does, and it questions the lengths that need to be gone to in order for social justice to be accomplished in reality. Most gamers find themselves in a position of privilege concerning LGBT rights, passively witnessing the community achieving social rights. They only occasionally lend their voice to this cause, despite the many discriminatory murders and overall culture of oppression that devalues these lives. The player’s relationship to both this viewpoint on social issues and Anders’ actions is based on whether they can actually blame him for his actions. Deciding whether what he did was right or wrong is only the most superficial analysis. Instead, the game forces the player to consider if blowing up the Chantry is what’s necessary for the oppression to end. Anders wants to ask players that call him a terrorist if they could live with themselves if everything stayed the same. This question isn’t supposed to have an easy answer. The ending events along with Fenris’ and Merrill’s personal quests complicate Anders’s position. The nuanced nature of Dragon Age II’s character drama speaks to the messy politics of reality. It trains the player to begin thinking “from this perspective” and breaks good/bad dichotomies. Dragon Age II is a testament to the social relevance that games can have by its blurring of the players’ sense of right and wrong and by its translation of that new understanding into actual activism for issues that exist in reality. Narrative is a naughty word. Its appearance in video game discussions trigger froth to arise from corners of mouths and paints internet forums red. This is most likely because of a prevailing insistence on entertaining an old binary argument: video games are just another medium for storytelling as opposed to narrative being an inconsequential component in games. The latter opinion, along with the ideas of ludology and formalism, mostly won out, and narrative studies maintains its underdog status in the debate. A recent addition to the barrage of anti-narratology essays is Raph Koster’s “Narrative is not a game mechanic,” which further insists on binary thinking in terms of narrative (“Narrative is not a game mechanic”, Raph Koster’s Website, 12 January 2010). Koster’s treatment of narrative as feedback and static information perpetuates a limiting attitude by misrepresenting what narrative actually is. However, it is not only one person or even the more active subscribers to this school of thought, but instead an ingrained perspective on narrative that polarizes the gaming community and stymies expression in the medium. This discussion often hits a roadblock because most people use the terms “narrative” and “story” interchangeably. From a design perspective, they are separate ideas. Narrative refers to how something is communicated, most often it is used to refer to the way that someone tells a story. We refer to a narrator, not a “storyer,” because the process of communicating an experience is at the heart of the word. Stories are descriptions using narrative elements, such as characters, plot events, point of view, and other mechanical techniques. Following this line of thought, Koster’s (among many others’) claim that “games can and do exist without narrative” is misleading. Games don’t necessarily tell “embedded stories,” such as saving the world from catastrophe, but they do always have a narrative. The easiest way to know if something has a narrative is to ask a person about their experience with that thing, and if they describe abstract events, like feeling excitement or finding something difficult, there’s a narrative there. Before anyone dismisses this as some sort of postmodern babble, what the player is actually experiencing has always been at the forefront of designers’ minds, but instead of just fun, narrative enables mechanics to express multiple and complex experiences. Games are constantly communicating experiences to the player, as when the height of all your pieces in Tetris is juxtaposed against the increasing speed of the falling blocks to create tension and provoke anxiety. In fact, how the game design world talks about “experience” closely relates to what narrative actually is or where narrative goes to provoke more than just a singular feeling. By relegating narrative elements to the service of rules and objectives, Koster removes the potential for narratives unique expression in games. Looking at narrative as only the context and sometimes the content that the rules exist in restricts it to exposition, and most creative work is only partly exposition. What makes this perspective on narrative difficult to support is its relative absence in games, though more development teams are starting to focus on it (see job descriptions of narrative designers). So far, video games rely largely on past media to tell their stories—for example, by creating cinematics or filling an experience up with text and dialogue. What we are just starting to find out is how games can tell stories in their own unique way, which often manifests in minimalistic games, often dubbed “art games.” The most popular example is Ico, which communicates the relationship between the protagonist and Yorda through a hand holding mechanic. The player receives the complex emotions of a relationship through the ludic circumstances that surround the situation that the characters find themselves in. You’re anxious when Ico has to leave Yorda on her own to solve a puzzle, breathing a sigh of relief when you find her unharmed or panicking when she’s captured. Your finger both feels at home and cramped on R1 as Ico drags her along. Without going too far into interpretation, Ico tells the typical boy-saves-girl story without relying on the narrative elements native to other mediums. Flipping the more commonly used term of ludonarrative dissonance, this is ludonarrative resonance, which would just be the successful use of game mechanics to communicate a narrative experience. In short, if game mechanics are meant to provide players with experiences such as fun and anxiety, then narrative actually is a game mechanic, as much as game mechanics can also be narrative elements. Ludology and narratology aren’t mutually exclusive studies. In fact, their combined perspectives will improve how video games influence players. Both are formally concerned with how the player interacts with the game and receives the intended experience of the developers. Keeping these aspects separate from one another only harms progression. Instead, one should include artists such as writers in the beginning stages of development so game mechanics and narrative design add necessary layers of complexity to communicate big ideas that only games can experience. Storyline? In Skyrim? No Thanks! When a game has many players who ignore the main quests and journey off to create their own stories, one should question the value of its embedded narrative. Does a game like Skyrim need a main storyline? The writing and character voice acting were okay and forgettable, just there for when I was in the area rather than being something of interest. I venture to say that the presence of a main story that you would find in other RPGs that don’t have such an open world is dissonant with how The Elder Scrolls series tells stories best. There are actually multiple narrative structures in conflict with one another in Skyrim—and arguably in Morrowind and Oblivion as well. The presence of fate as a central concern grows stronger in each installment, with Skyrim sometimes going as far as to control your character’s movement for you. The concept of fate is antithetical to the type of play that The Elder Scrolls promotes, which is player-focused and controlled. However, we’re so used to convention that we expect cutscenes and epic storylines to unfold before us. We’re not used to the idea of “This is my story” unless it’s a Minecraft or Dwarf Fortress that we are experiencing. Skyrim doesn’t need a storyline for the player to experience their own. It wasn’t until the Jarl of Windhelm told me that I couldn’t ignore the summons of the Greybeards (and I promptly did) that I realized that the only support for a “fate” determining the protagonist’s actions in the game was the existence of a main story. A player will question being determined by the storyline a lot less in a Final Fantasy because there aren’t tools to exercise freedom from the main action. But when serendipitous events such as a dragon attack or a king’s assassination frame the reasoning for your freedom, something just doesn’t feel right. The series already exists in tension with the realistic aesthetic that it attempts to adhere to, and its dependence on the player believing that they are fated to enact certain deeds undermines the spirit of the games. Skyrim’s stronger narrative structure is found in the small details of a grand landscape. The locations and items themselves are the plot points and characters for the player to read. The focus on player initiative is also paramount to the narrative; the only way to speak of these stories from the game is to recount an anecdotal experience. The stories that my character encountered were finding out what the people of Skyrim hid in their homes, dungeons, and pockets. What’s this guy doing with a Ring of Pickpocketing? Who is experimenting on these vampires? Do I even want to know what “The Lusty Argonian Maid” is doing here? There are little stories waiting for discovery, not forced on the player through exposition or instruction. I found a witch’s letter detailing an interest in starting a coven with her daughter, a maid in a fortress constantly under attack. Those people weren’t telling the story; I created one in my mind. The narrative rests in the relationship between the environment and the items found in it, specifically placed for the player to find and create an explanation of them. My response? Abandon quests altogether for future Elder Scrolls games. Skyrim is at a place in its evolution where the series can’t rationalize holding onto several RPG conventions for convention’s sake. There is no reason that we need to go into Skyrim expecting quests to guide us along everywhere because the point of the game is to explore with player-driven volition. I can see a Skyrim that has no quests that are explicitly given to the player but only offers rumors and clues along with different ways of obtaining them. My first time in Riverwood, I was looting the general store on the top floor and happened to overhear some siblings arguing over finding something called the golden claw. Just that knowledge should have empowered me to go find it, but Skyrim relies on the quest-giving model and its explicitly defined objectives, which are all created by developers instead of the player. This is especially problematic when you get the claw back from the bandit who holds it. Your game journal tells you to explore the barrow further. My decision to keep going into the ruins or to get the claw back to the store would be more meaningful if I came to that decision on my own, as hints were already there to do so. I left Skyrim feeling that this was it. There’s nowhere else to progress given the trajectory the series has found for itself. It’s the same ol’ fantasy with the same ol’ combat, the same “epic” story that I have seen before. A stronger focus on helping the player tell their stories through the method that The Elder Scrolls has established would shed the necessity that binds the series in its RPG conventions. As recent RPG developers have found, the usual ways that the genre tells stories isn’t working anymore, and there’s little progress in designing something players haven’t seen before. The narrative is in the play. Let me play. Which game was the biggest disappointment this year? Many gamers (me included) would answer with Dragon Age II by BioWare. With recycled environments, combat void of tactics, and a meaningless item system, BioWare seemed to do quick work of unraveling the success of Dragon Age: Origins. After completing the game, I read some criticism that changed my mind. So much, in fact, that I count Dragon Age II as not only superior to its predecessor, but one of the best games that I’ve ever played. This turn of my dissatisfaction into fervency led me to reflect on how game criticism enables such changes in perspective. In “Games Aren’t Clocks,” Michael Abbott challenges the preoccupation that critics have with judging a game’s value mostly around its gameplay (“Games Aren’t Clocks”, The Brainy Gamer, 11 September 2011). Abbott’s take on the issue implies that gamers will put up with lackluster results in something like narrative as long as the gameplay is good enough, but not the other way around. This doesn’t excuse Dragon Age II its many negatives, which have been fleshed out by many critics. However, the complaints focus on gameplay and are spare in commenting on a character drama rarely seen in games. Good writing is rare to come across in gaming, and Dragon Age II engages with the conversation on how to imbue a game with meaning through its narrative elements. It’s possible that gamers haven’t figured out a use for criticism, as the recent debacle over game reviews’ ratings teaches us. Most game criticism strives to assign objective-like values onto games with the assumption that the reader is researching a game for purchase. On the other hand, articles like Alex Raymond’s “A fate that we deserve: Choice, Triumph, and All That Remains” offers a viewpoint that the player might have not considered (“A fate that we deserve: Choice, Triumph, and All That Remains”, While !Finished, 27 September 2011). This type of game criticism is a means to understanding the game rather than an assessment of its value, a lens to highlight certain features and focus a player’s attention to subtleties that surface elements obscure. Raymond pushes aside the categories that Abbott finds unsatisfactory, like gameplay, to center on the characters. A knee-jerk reaction might accuse this perspective as one that views games under the same rubrics that define literary or film criticism, but it is actually the tension surrounding character interaction that makes Dragon Age II so compelling. The game’s characters are unconventional in having lives and pursuits of their own, acting upon the story world as they want to, and not asking the player for permission to do so. The player visits their party members, watches them interact with one another, and changes the tone of the game by building rivalries and friendships. In her article, Raymond readjusts some aspects of Dragon Age II perceived as faults into evidence of a great game. Some players saw Hawke as ineffectual, unable to control many of the game’s events. Raymond’s analysis instead suggests that the game is forcing the player to experience something that they don’t feel often in games: powerlessness. It uses the player’s predisposition to having control against them. Instead of being like other games and looking to empower players by giving them the illusion of freedom and choice, Dragon Age II tells the player that they are not a superhero. Instead, Hawke is a survivor and witness to catastrophic events that they had little to do with by comparison to others. The constant character drama reinforces this feeling; the “game” exists in the relationships, not the events. This is when the light bulb went on for me. Like others, I had a mild affection for most of the characters in Dragon Age II but felt like there was little to them. I didn’t realize that seeing the sheer skill that went into building their characterization occurs only over multiple playthroughs. How the player handles these relationships, what kind of personality Hawke has, the stance they take in the Templars vs. Mage conflict, all change the nuances of the character’s attitudes and personalities. The ultimate example of this process, for me, revolves around Anders destroying the Chantry, as it is an event that prompts the player to parse complicated feelings with their own ideology. Was Hawke Anders’s friend, lover, or rival? Were they for or against the Templars? Given the choice of what to do with Anders afterwards, the player must reflect on what brought them to this point and what seems to be the most monumental choice for their game. I replayed the game three times after this realization. I saw a bubbly, benign Merrill and a stubborn, selfish one recontexualizing the fate of her clan. I can’t decide if Fenris is an outright bigot or a justified skeptic, as I’ve seen both versions of the character. In other words, Dragon Age II presents gamers with meaningful interaction with relationships themselves in video games, a feat commonly fumbled at by other games. It took only one section of one article to reach this level of appreciation for a game that I thought was past redemption. Game criticism can add replay value to games and make them culturally significant, a process that takes looking past just the gameplay and considering what the whole might mean.